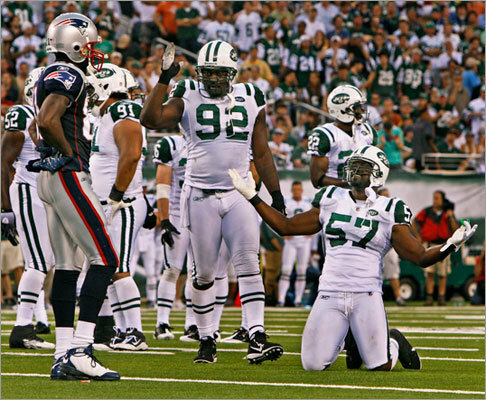 The Patriots showed they are taking defense seriously, and have agreed to terms with former New York Jets defensive end Shaun Ellis (center). Ellis is 6-foot-5 and 290 pounds with a versatile background that would give Bill Belichick a few more options, especially if the Patriots lean more on the 4-3 this year. Last season Ellis collected 36 tackles and 4.5 sacks.The 34-year old has 499 total tackles and 72.5 sacks in his career and has played his entire career with the Jets. Ellis is just the latest big name to sign with the Patriots. Scroll through the gallery to learn more about New England's new acquisitions.